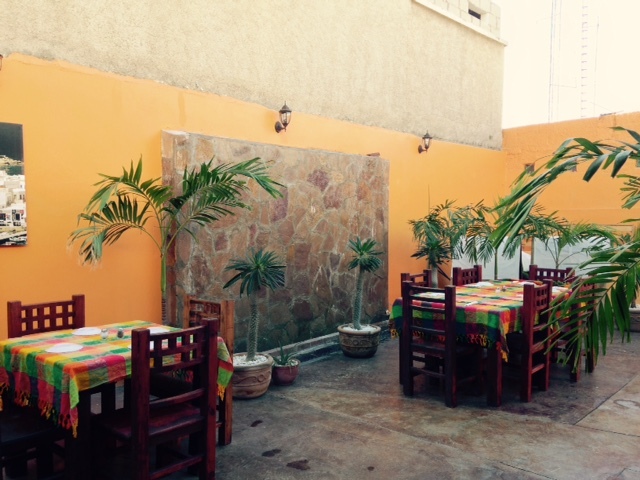 As we wrapped up the time in La Paz | It's not a slow car, it's a fast house! Since we had pre-paid for a week, we decided to stay the whole week and look for the best in La Paz rather than the worst. Once we had secured parking sorted out we were ready to play! We went snorkeling with the whale sharks in the bay. They are HUGE, docile creatures that just bob in the water filtering plankton. We swam around, under, beside and over them. They are 20 to 30 feet long and have spots all over them that look like stars through the water. They were very beautiful. It was a terrific experience. Check out the play called “Zoot Suit.” We were fortunate to catch a live production of it by the Nacional Theater Company of Mexico. The production was in Spanish, but the actors and actresses were so skilled that it was easy to pick up a few words and read their actions to make sense of the plot. It was all about racial hassles in LA in the early 40’s over the style of dress called a Zoot Suit. Interesting how racial discrimination is so often still about how people dress! The stage backdrop- the only part that was in English for 2 hours! 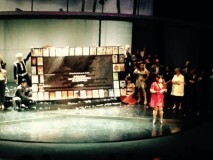 A beautiful and elaborate stage production by the Nacional Theatre group. Mango hanging out on the van bed. The thing I thought was ringworm on Mango was NOT ringworm. It healed too quickly and did not spread to anyone else. I think she got bit by a gnat, mosquito, chigger or spider. Then I over-eacted and puts lots of stuff on it (tea tree oil, colloidal silver, lotrimin) and now it is rashy looking where I over-smeared the creams. I will continue with the colloidal silver (most gentle) and see what happens. We went to a CineMex and saw Exodus. The plot was interesting, from a historical and Biblical perspective but the other stuff was tough. There was a lot of violence and animals being killed. This showing of the movie was spoken in English, with the words typed in Spanish. This meant that the kids below us were reading aloud for most of the movie (to their younger siblings) but the movie was so loud that I was able to ignore them. During several of our trips to town we found a wonderful Greek restaurant. 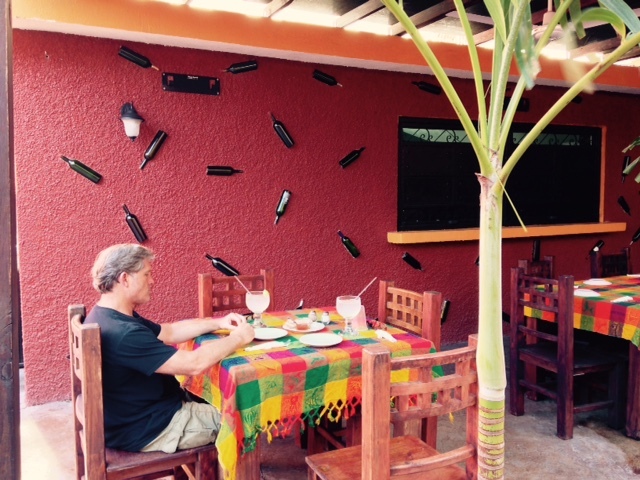 It has a very clever wall decorated with wine bottles imbedded into the stucco and a rock wall waterfall on the other side. 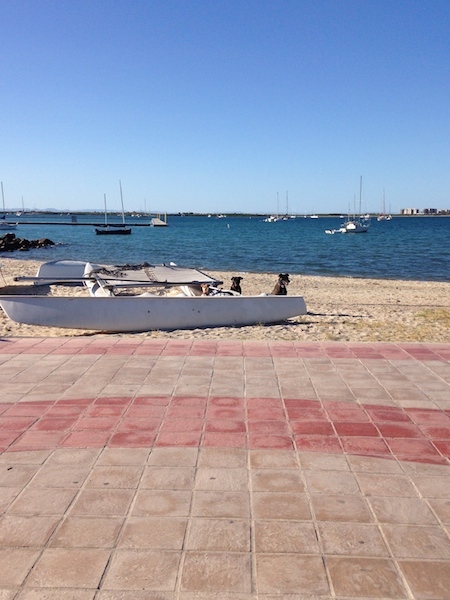 One of our adventures involved a walk along the malecón to look for new snorkeling gear. 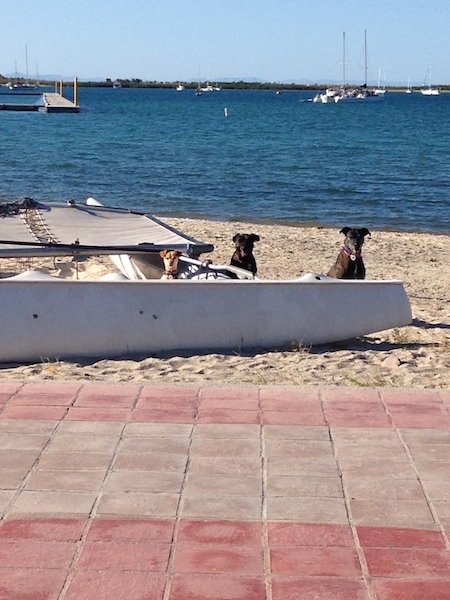 We left the dogs tied to an abandoned catamaran while we went in the store. Who is peeking over the boat? We bought new masks and snorkels. We still have our fins and we will not replace the booties we lost. It was fairly cheap for new gear and honestly the new mask is much more…. modern than what I lost. I can see more clearly and have a wider field of vision. So I guess it was a good outcome. I am excited for a chance to use the gear in some beautiful snorkeling water soon. The dogs are doing great. They have caught up on their rest in this apartment and they bug us for walks often. 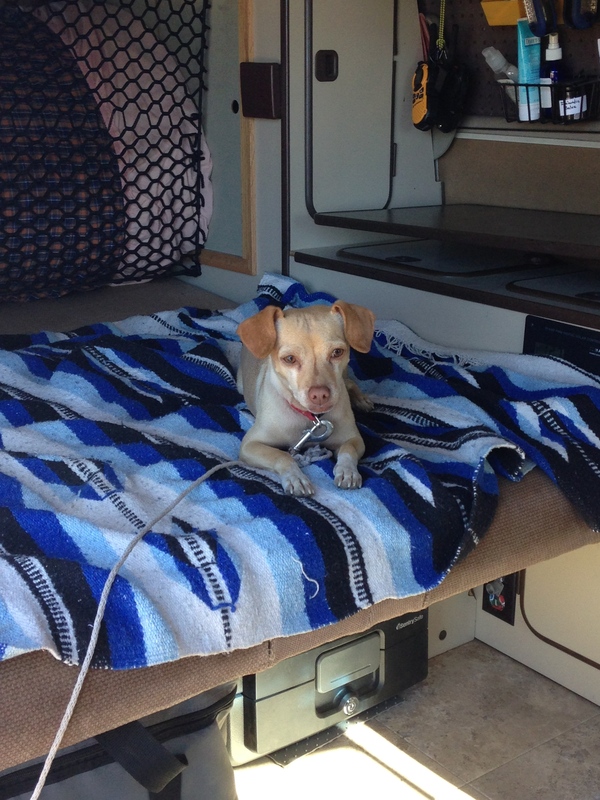 But when we pull up in the van, they run out the gate and jump in the van- – – ready to go wherever. So I am sure they will be ready to leave. 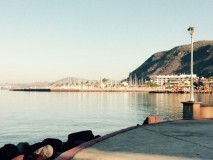 Our final evening in La Paz was spent walking the malecón at sunset. We had papas rellenas for dinner. 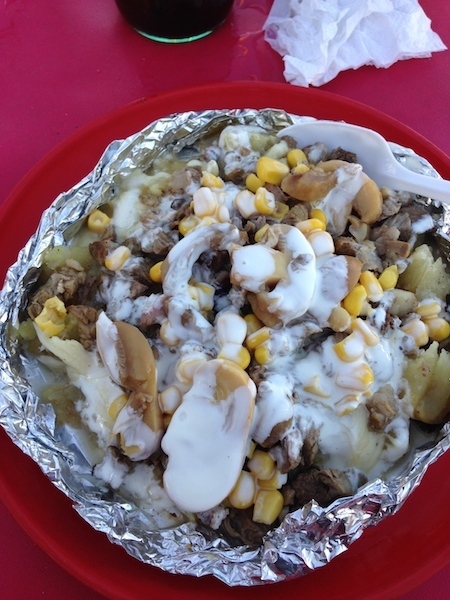 This is a half a baked potato with butter, cheese, green chilies sour cream and chunks of roasted beef. Delicious! 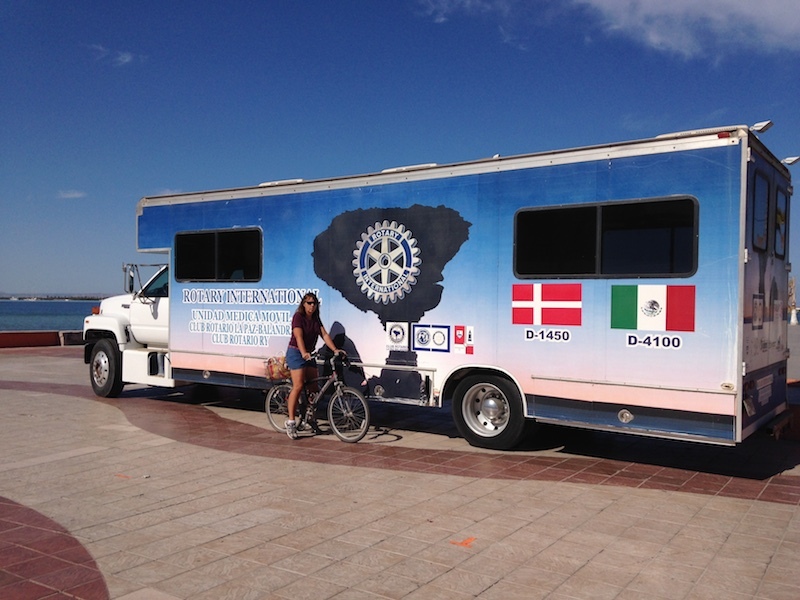 The local Rotary club has a partnership with a club in the Netherlands and they sponsor this mobile health clinic. There were people lined up for services. The huge tree with lights seems to be sponsored by Rotary and Coca-Cola and the gazebo will probably host Santa soon. We stopped for a while to watch teens doing parkour on the benches, walls and monuments. Much like American teens- they were cocky, energetic and enjoying their flexible youth in a fun way! While we were walking the streets erupted in a celebration. 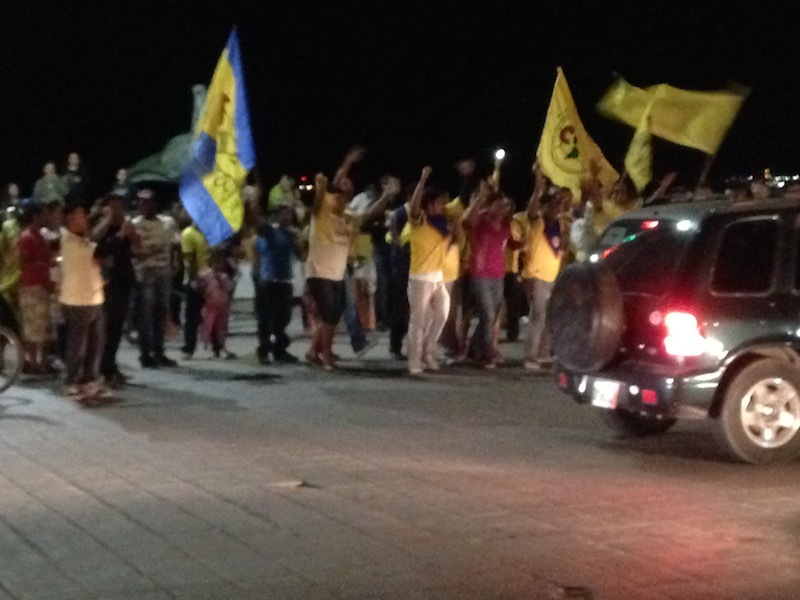 Folks were chanting and waving flags and honking horns as they celebrated a futbol (soccer) victory for one of their favorite teams. 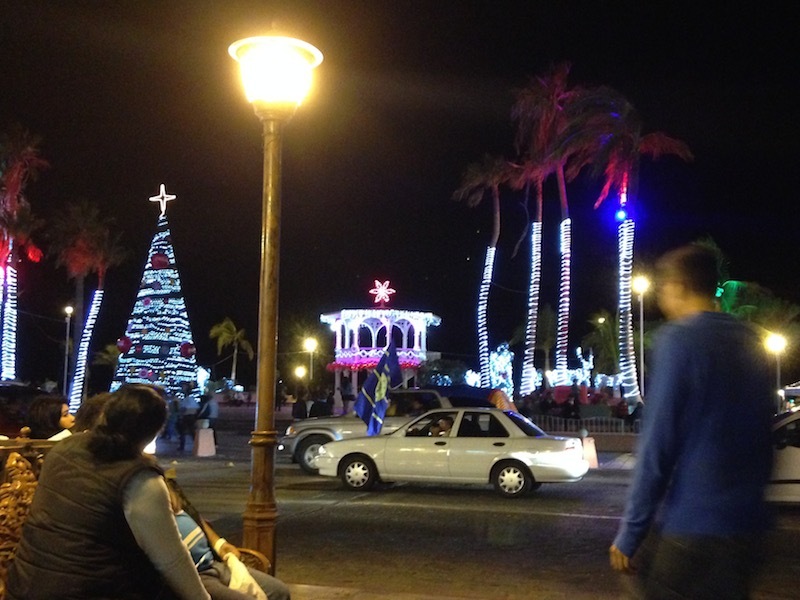 It was an exciting evening and a great closure to our time in La Paz. 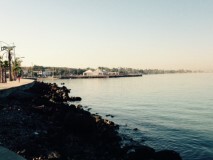 ← La Paz- some days are diamonds and some days stink! Glad the rest of your time in beautiful La Paz has been good. Sounds like a good time!